The knives, originally with steel blades have been replaced at some time with the more practical stainless blades. 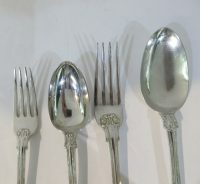 The Spoons & Forks Weigh A Total Of 5510 Grams = 177 Troy oz = 194.25 Regular Ounces. All items are antique or used items, and as such nothing is ‘perfect’, but we always will describe any damage, repair, inscriptions, monograms etc to the best of our ability. Returns only accepted if not as described. Please ask any questions BEFORE purchasing any item. All items are available to inspect, and pick up, at our Manhattan gallery. 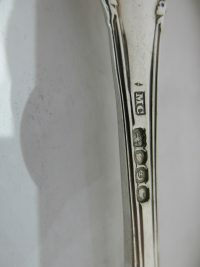 CHAWNER & CO.Flatware-making is one of the sub specialties of silversmithing. 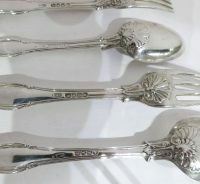 In the 18th and 19th century the vast majority of spoons and forks were made by specialist “spoon makers” (knives were made by an entirely different tradesman called a cutler). 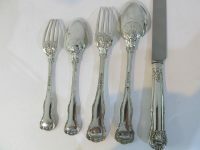 The Chawner family was one of England’s dominant producers of silver flatware in the 19th century. 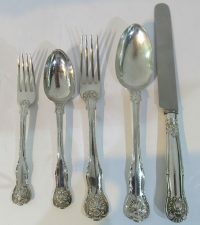 William Chawner II began a seven year spoon-making apprenticeship with the prolific flatware makers William Eley and William Fearn in 1797. He became the third partner of this company in 1808. Seven years later, he set up Chawner & Co. which would become one of the largest producers of silver flatware through the 19th century. When Chawner died in 1834, his widow Mary Chawner registered her own marks and took over with her son-in-law George Adams. Chawner & Co were supplier to the retail houses of Hunt & Roskell, R.& S. Garrard & Co, Elkington & Co. Chawner & Co is renowned not only for quality but the breadth of patterns they offered. Their pattern book from the mid 19th century included 47 patterns, far more than was typical at the time. The company was eventually sold in 1883 to Holland, Aldwinckle & Slater. We Have A Huge Selection Of English Flatware Pieces To Complete Your Antique Set. We Sell Single Pieces Or Entire Sets & Well As Knives. Check Our Ebay Page www.EstateSilver.biz For A Small Selection, Or Feel Free To Visit Our Manhattan Gallery To See Our Entire Inventory.